Rand Soellner Architect’s forte is in custom Mountain Lodge Homes design. He creates custom homes for flatland as well and in fact has billions of dollars worth of projects designed in Florida. Some people think he only designs mountain homes and this is not the case. However, he is good at mountain home design and has won awards for this. We hope you enjoy the mountain lodge homes presented here. 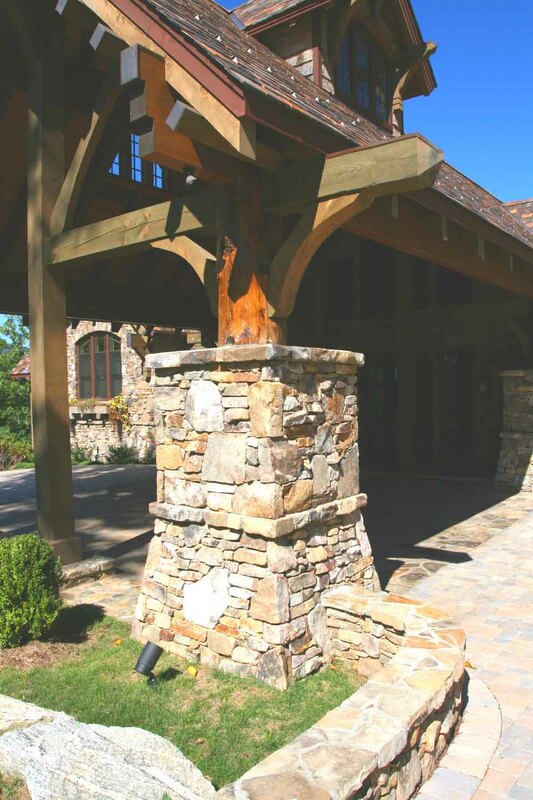 One of Rand Soellner Architect’s custom mountain lodge homes, featuring a native stone pedestal with supporting timber post and beam structure at one of his porte-cocheres. (C)Copyright 2005-2010 Rand Soellner, All Rights Reserved Worldwide. Mountain lodge homes have robust characteristics: big beams, big rocks, big fireplaces, big main rooms, big views. Soellner specializes in the design of custom mountain lodge homes, as you will see from the examples indicated above in the mountain lodge homes index. There is a sense of anticipation as you approach a lodge type of house in mountain environments. Those, like Soellner, who create these unique places, design the site and approach sequence with every bit of artistry as they do the main house. For those of you who would like to have a closer look, Rand Soellner escorts his client-visitors to one or two of these unique spectacular homes when you come to visit him to see about his firm becoming your home architects. We encourage you to take advantage of this interesting opportunity to see some of the most breathtaking custom mountain lodge homes in the world. Do you think that is overstating? 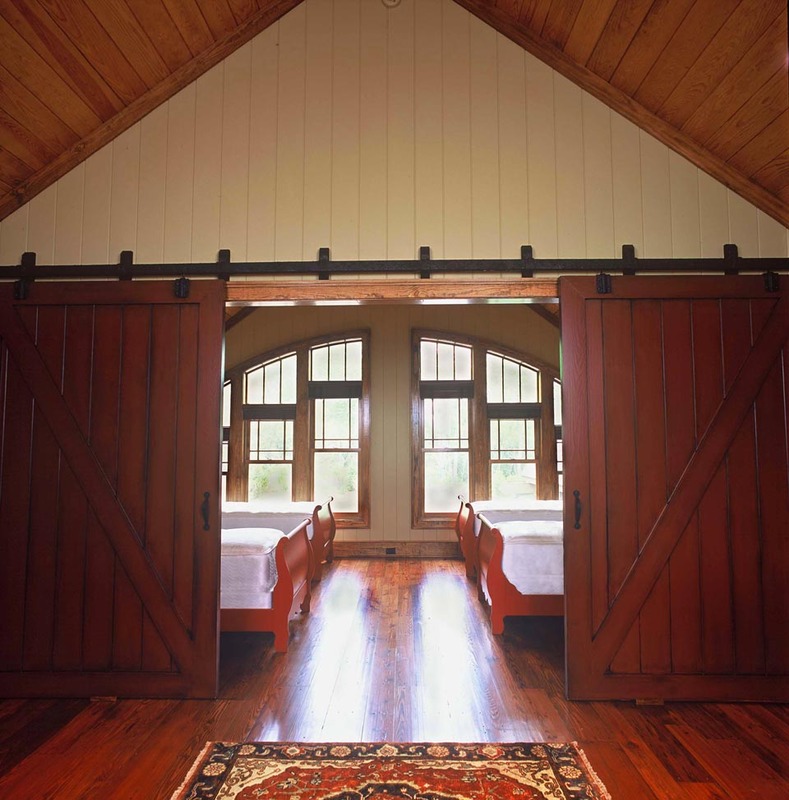 Inside one of Rand Soellner’s mountain lodge homes, a pair of custom made barn doors on an overhead track, that slide open to merge the space of a bunkroom for grandkids and adjacent study-family room for greater open plan spaciousness. (C)Copyright 2005-2010 Rand Soellner, All Rights Reserved Worldwide. Well…every single one of the above mountain lodge homes are featured in the recent full-color coffee table book released by Images Publishing. In this thick volume are about the top 100+/- mountain homes in the world, from around the globe, including the work of Mario Botta and other high-ranking mainstream architects. The publishers asked Rand Soellner to participate, as his designs stand apart from all of the other houses in the book. How so? Rand Soellner’s houses are his own special brand of mountain lodge homes. They have texture. They have large timber beams and timber trusses. They have substantial native rock, they have large rock fireplaces and chimnies. They have open plan home designs. They have big framed views. They have steeply pitched roofs, often with slate or similar roofing. They have timber frame and post and beam structural systems. They have large open kitchens. They have outdoor living rooms and summer kitchens. One of Rand’s recent clients purchased House With A View and reported back to him that the only homes in it that she liked were designed by the Soellner firm. Rand thanked her, even though he does appreciate the efforts of all of the other architects who designed projects in the book. Their work tends to be modern, with lots of large, flat white painted surfaces. Soellner’s tends to be more naturalistic with rockwork, large timber posts and beams and giant windows looking at the mountain views. 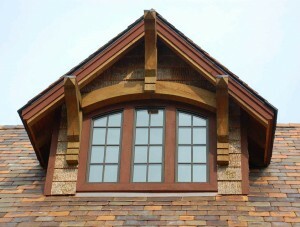 A dormer on one of Rand Soellner’s mountain lodge homes. (C)Copyright 2005-2010 Rand Soellner, All Rights Reserved Worldwide. Mountain lodge homes are all about the view, according to Soellner, that and the “look,” which Soellner says he does like breathing these days. This is Rand & Merry Soellner’s own home. It has become a classic mountain lodge worldwide. It has faux slate roof tiles, native stone pedestals, log posts, timber posts, timber roof truss over the Hearth Room, board and batten white pine wood exterior wall siding, prairie style window grilles, log siding invention of Soellner’s, large window areas facing a spectacular views of Laurel Knob Mountain. This Lake Toxaway home designed by mountain lodge architects Soellner, features faux slate concrete roof tiles resembling 500 year old Bavarian slate, mountain lodge style bracing and bracketry, large log posts and horizontal beams, timber posts, spacious open plan home design layout, poplar bark shingles and magnificent views of Lake Toxaway and the surrounding mountains. Mountain lodge architects Soellner created this home in Ravenel Ridge, Highlands North Carolina. This estate-sized residence has Arts and Crafts style detailing and large interior spaces. This mountain lodge is different in that its Outdoor Living area was positioned to the side rear instead of the center rear. Also there is a nice bunkroom over the semi-detached garage, home office, exercise room loft, elegant master suite and screened Sleeping Porch. Please click here: mountain homes architect for more information on this leading residential architecture company. tags: mountain lodge, timber frame, post and beam, log home architect, custom, green, luxury residential, castle, mansion, small, log mansions, cottage, arts and crafts, stone, family estate, vacation house, cashiers, highlands, jackson hole.